You are flying at 37,000 feet, in a new state-of-the-art airliner... so how on earth could a child suddenly disappear from your plane? This nerve-shattering question lies at the heart of FLIGHTPLAN, a visceral suspense thriller that transports the audience into the turbulent confines of an international flight -- and puts them at the very center of a chilling human mystery as they jet from Berlin to New York. Two-time Academy Award winner Jodie Foster stars as Kyle Pratt, the frantic but fiercely intelligent mother whose deepest protective instincts will be triggered by a haunting in-flight nightmare: in the middle of the trans-Atlantic trip, her young daughter turns up missing without a trace. The dilemma facing the passengers and crew onboard is exactly the same predicament that audiences of FLIGHTPLAN will experience: is Kyle Pratt (FOSTER), who arrives on the flight still reeling from the recent loss of her husband, a woman who has gone mad with grief or a formidably determined mother whose child is in grave danger that threatens the entire plane? Adding to the growing mystery is the fact that the name of Kyle’s daughter doesn’t even appear on the flight manifest. Furthermore, neither of the flight attendants (ERIKA CHRISTENSEN, KATE BEAHAN) can remember seeing the child on the plane. While Captain Rich (SEAN BEAN) and Air Marshal Gene Carson (PETER SARSGAARD) don’t want to doubt Kyle’s insistent claim that her daughter has vanished, all evidence points to the fact that Kyle’s little girl was never on board. What is the truth behind Kyle Pratt’s distress? Who on board can be trusted? And just how far will Kyle have to go to get to the bottom of the harrowing mystery? As paranoia and doubt mount among the passengers, Kyle is confronted with some of the most unsettling fears a mother could ever face -- losing her child, having her very reality questioned and being trapped in a situation where no one can seem to help. Pushed to the edge and fighting for her sanity, Kyle finds herself willing to go to unimaginable lengths to save her daughter. Jodie Foster teams up with Academy Award-winning producer Brian Grazer (A Beautiful Mind, 8 Mile, Ransom) to bring this original tale of high-flying suspense to life. Playing against Foster as the passengers and crew who alternately doubt and fear her is a supporting cast noted for their critically acclaimed performances in both action epics and grittier independent features, including Peter Sarsgaard, Erika Christensen, Kate Beahan and Sean Bean. Seven-year-old Marlene Lawston makes her feature film debut as Foster’s daughter, whose disappearance thrusts the international flight into chaos and paranoia. 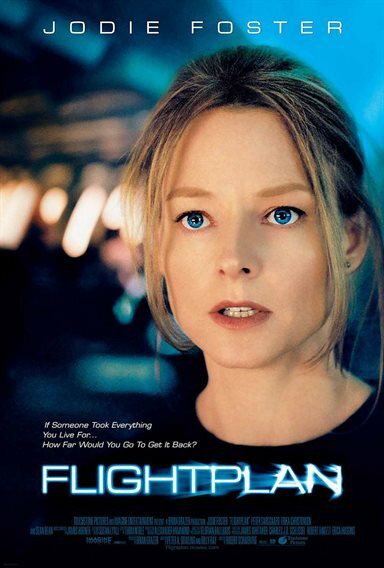 Download Flightplan in Digital HD from the iTunes store. Flightplan images are © Touchstone Pictures. All Rights Reserved.